Happy Week 2! Hope you’re all enjoying the Shape Up so far! By now, you should feel a little pep in your step and extra energy from the new routine. 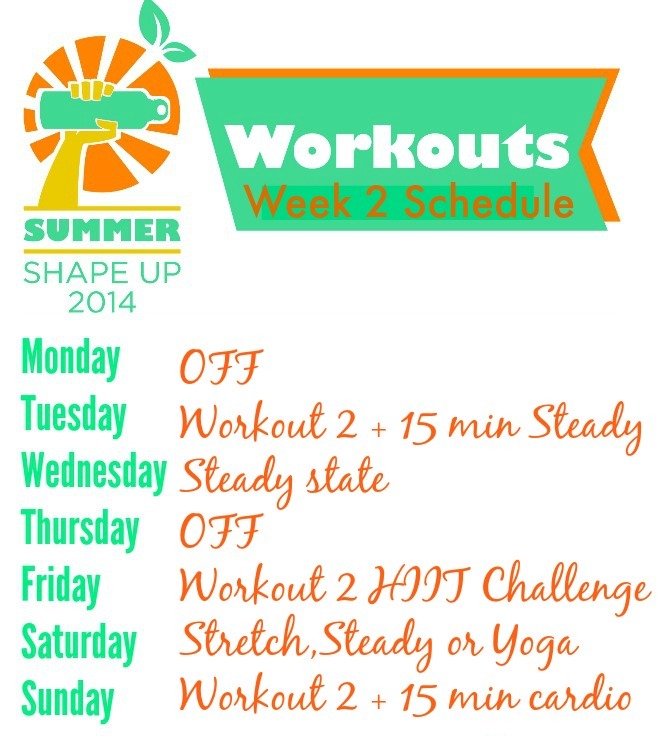 Keep up the amazing work, and keep the awesome check-ins rolling in (#summershapeup @fitnessista @fannetasticfood). 15 minute steady state: maintain a quick pace for 15 minutes steady state. This can be any cardio of choice (Stairmill, running, walking, jump roping, rowing, elliptical…) but if you’re looking for an extra challenge, here’s the kicker: increase the incline 2% over what you’re used to. Steady state: take a cardio class, go for a run or long walk. Aim for 30-45 minutes. 15 minute cardio: your choice (steady state, hills, HIIT or tempo). If you choose to do HIIT, try 30 seconds HARD, 30 seconds easy. Here is the week 2 workout. Like last week, this is intended to be completed circuit-style with a max of 3 rounds through the circuit. Form cues and modifications are below; please let me know if you have any questions! Be sure to warm up for 5-7 minutes and follow with cardio either on your own or according to the schedule above. Cool down and stretch after each workout. Hope you love it! This is the post where you’ll be entering this week’s giveaway! Leave a comment below with your workout (how you feel, what you did!) and I’ll pick the lucky winner next Sunday night (6/29). Week 2, we’re coming after you! We’re traveling this week so it’s been a challenge- but we’re trying to build in walks during the day- which happily double as sight-seeing! 20 minute run and 3x through for workout 2! Did a class at the gym that included cardio intervals and weight work. It was a good one. Did a yoga video tonight to get ready for a new week of summer shape up!! 3.5 mile power walk today and 2 rounds of workout #2! Yoga & walk today, trip to the local dog “beach” at the lake. 30+ corgis in one place- too fun! Super long walk around the city and through Central Park followed by some yoga. Took a two hour walk to get some sun on my Sunday. Wish I got home early enough to do it every day! Yesterday was my weekly 10 miles on the local prairie path by our house. It went pretty well, despite that it was starting to warm up for the day and fairly humid. At my one stop I heard my Nike+ say that my pace was somewhere around 11 minutes, and that was not what I wanted to hear, giving me the motivation to speed up for the final few miles and finish with an average time of 9:42. Pilates and a long walk today. I ended up resting today. Apparently yesterday’s run plus the wear and tear of taking care of an infant was too much for my body! Still on the mend. I see the PT tomorrow, I hope I get the OK to start working out again! Stretching is getting boring! Did a 2-hr hike on Saturday. Sunday got away from me, but I did clean the house (always makes me break a sweat) and danced my feet off at the SF Pride Festival.